Glenn Hammond Curtiss (21 May 1878 – 23 July 1930) was an American aviation pioneer and founder of the Curtiss Aeroplane and Motor Company, now part of Curtiss-Wright Corporation. Curtiss was born in 1878 in Hammondsport, New York to Frank Richmond Curtiss and Lua Andrews. Although he only received a formal education up to Grade 8, his early interest in mechanics and inventions was evident at his first job at the Eastman Dry Plate and Film Company (later Eastman Kodak Company) in Rochester, New York. He invented a stencil machine adopted at the plant and later built a rudimentary camera to study photography. On 7 March 1898, Curtiss married Lena Pearl Neff, daughter of Guy L. Neff, in Hammondsport, NY. Curtiss began his career as a Western Union bicycle messenger, a bicycle racer, and bicycle shop owner. In 1901 he developed an interest in motorcycles when internal combustion engines became more available. In 1902 he began manufacturing motorcycles with his own single cylinder engines. His first motorcycle actually had a tomato can for a carburetor. In 1903 he set a motorcycle land speed record at 64 miles per hour for one mile. In 1907 he set a world record of 136.36 miles per hour, on a 40 horsepower V8 powered motorcycle of his own design and construction. For four years, until 1911, he was literally "The Fastest Man on Earth". At this time he was considered by many to be America's No. 1 maker of high-performance motorcycles. 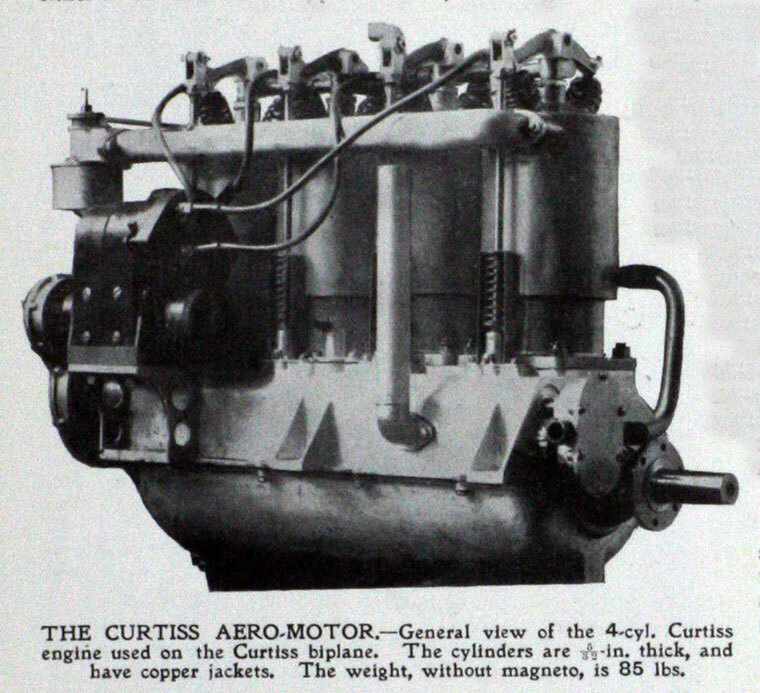 In 1904, Curtiss became a supplier of engines for California "aeronaut", Tom Baldwin. In that same year, Baldwin's California Arrow, powered by a Curtiss 9 HP V-twin motorcycle engine, became the first successful dirigible in America. In 1907, Curtiss was approached by Alexander Graham Bell to provide a suitable engine for heavier-than-air flight experimentation. Bell was impressed by Curtiss and his engine, the result being an invitation to join Bell's Aerial Experiment Association (AEA). Through the course of the next two years, the AEA produced four aircraft, each one an improvement over the last. Curtiss primarily designed and flew their third aircraft, the famous June Bug, 5,080 feet on 4 July 1908 to win the Scientific American Trophy. This was considered to be the first pre-announced public flight of a heavier-than-air flying machine in America. For this flight and for other achievements that were to follow, Curtiss received U.S. Pilot's license #1 from the Aero Club of America. The flight of the June Bug propelled Glenn Curtiss and aviation firmly into public awareness. 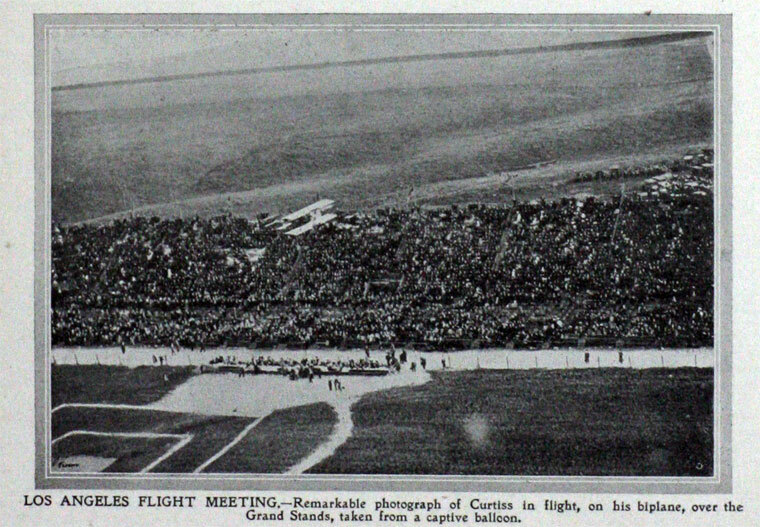 In August 1909, Curtiss competed in the world's first air meet, the Grande Semaine d'Aviation flying contest at Rheims, France, organized by the Aero-Club de France. The Wright Brothers, who were selling their machines to customers in Germany at the time, elected to not personally compete. There were two Wright aircraft at the meet but they did not win any events. Curtiss went on to win the overall speed event, flying a 10 km course at 46.5 miles per hour (74.8 km/h) in just under 16 minutes, six seconds faster than runner-up Louis Bleriot and winning the Gordon Bennett Cup. For this he was awarded French pilot's license No. 2 (Bleriot, who flew the English Channel in 1909, had been awarded license No. 1). It is notable that two years earlier, Curtiss went 90 mph faster on a motorcycle. During the 1909-1910 period, Curtiss employed a number of demonstration pilots including Eugene Ely, Charles Hamilton and Lincoln Beachey. Aerial competitions and demonstration flights across North America helped to introduce aviation to a curious public; Curtiss took full advantage of these occasions to promote his products. In May 1910, he flew from Albany to New York City to make the first long-distance flight between two major cities in the U.S. For this 137-mile flight, he won a $10,000 prize offered by publisher Joseph Pulitzer and was awarded permanent possession of the Scientific America Trophy. A month later he provided a simulated bombing demonstration to Naval officers at Hammondsport. 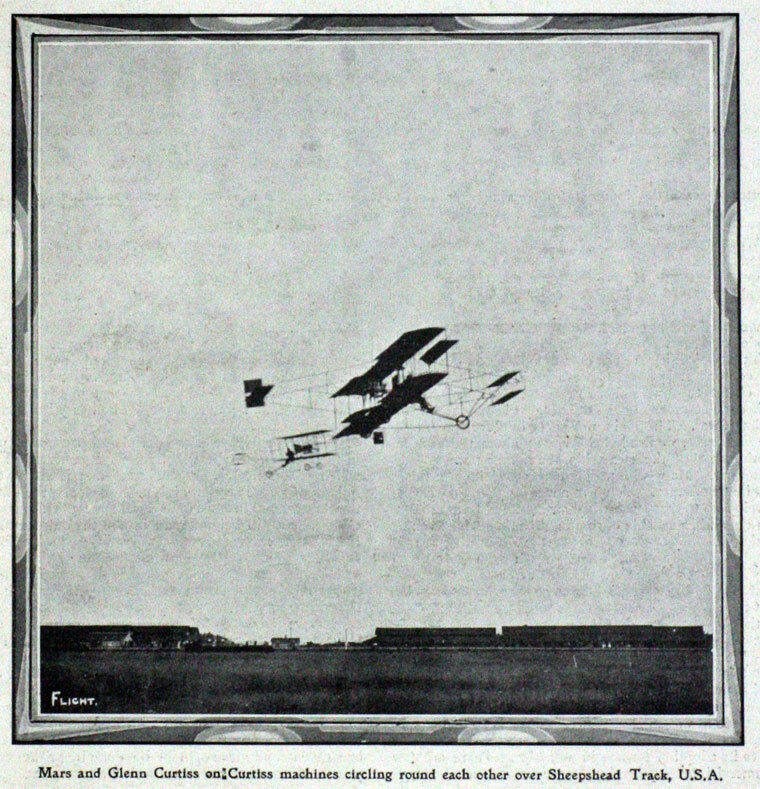 Two months later, Lt. Jacob E. Fickel demonstrated the feasibility of shooting at targets on the ground from an aircraft with Curtiss serving as pilot. One month later, in September, he trained the first woman pilot, Blanche Stuart Scott. On 14 November 1910, Curtiss demonstration pilot Eugene Ely took off from a temporary platform mounted on the forward deck of the cruiser USS Birmingham. His successful takeoff and ensuing flight to shore marked the beginning of a relationship between Curtiss and the Navy that remained significant for decades. At the end of 1910, Curtiss established a winter encampment at San Diego to teach flying to Army and Naval personnel. It was here that he trained Lt. Theodore Ellyson, who was to become U.S. Naval Aviator #1. The original site of this winter encampment is now part of Naval Air Station North Island and is referred to by the Navy as "The Birthplace of Naval Aviation". Through the course of that winter, Curtiss was able to develop a float (pontoon) design that would enable him to take off and land on water. Demonstrations of this advancement were of great interest to the Navy, but more significant as far as the Navy was concerned, was Eugene Ely successfully landing his Curtiss pusher (the same aircraft used to take off from the Birmingham) on a makeshift platform mounted on the rear deck of the battleship USS Pennsylvania. This was the first arrester-cable landing on a ship and the precursor of modern day carrier operations. Curtiss custom built floats and adapted them onto a Model D so it could take off and land on water to prove the concept. 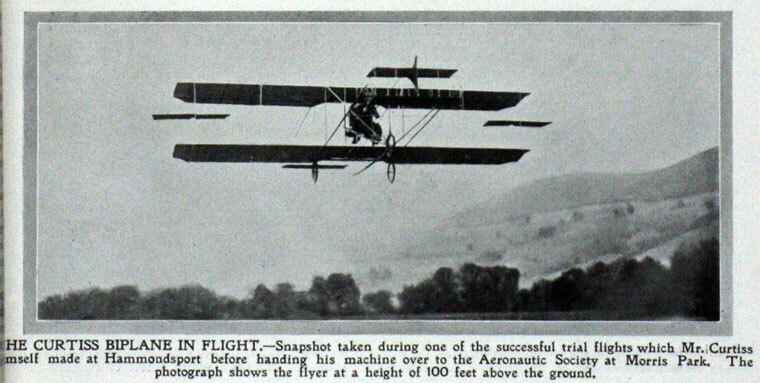 Back in Hammondsport six months later, in July 1911, Curtiss sold the U.S. Navy their first aircraft, the A-1 Triad. The A-1, which was primarily a seaplane, was equipped with retractable wheels, also making it the first amphibian. Curtiss trained the Navy's first pilots and built their first aircraft. For this he is considered in the USA to be "The Father of Naval Aviation". The A-1 was immediately recognized as so obviously useful, it was purchased by the U.S. Navy, Russia, Japan, Germany, and Britain. Curtiss won the Collier Trophy for designing this aircraft. Around this time Curtiss met the retired English naval officer John Cyril Porte who was looking for a partner to produce an aircraft with him in order to win the Daily Mail prize for the first transatlantic crossing. In 1912 Curtiss produced the two-seat "Flying Fish", a larger craft that became classified as a flying boat because the hull sat in the water; it featured an innovative notch in the hull that Porte had recommended for breaking clear of the water at takeoff. Curtiss correctly surmised that this configuration was more suited to building a larger long-distance craft that could operate from water, and was also more stable when operating from a choppy surface. In collaboration with Porte, in 1914 Curtiss designed the "America", a larger flying boat with two engines, for the Atlantic crossing. WIth the start of World War I Porte returned to service in the Royal Navy's Seaplane Experimental Station, which subsequently purchased several models of the America from Curtiss, now called the H-4. Porte licensed and further developed the designs, constructing a range of Felixstowe long-range patrol aircraft, and from his experience passed back improvements to the hull to Curtiss. The later British designs were sold to the U.S. forces, or built by Curtiss as the F5L. The Curtiss factory also built a total of 68 "Large Americas" which evolved into the H-12, the only American designed and American built aircraft that saw combat in World War I. As 1916 approached, it was feared that the United States would be drawn into the conflict. The U.S. Army Air Corps ordered the development of a simple, easy to fly and maintain two-seat trainer. Curtiss created the JN-4 "Jenny" for the Army, and the N-9 seaplane version for the Navy. It is one of the most famous products of the Curtiss company, and thousands were sold to the military of the United States, Canada and Britain. Civilian and military aircraft demand was booming and this year saw their operations grow to employ 18,000 workers in Buffalo and 3,000 workers in Hammondsport. In 1917 the U.S. Navy commissioned Curtiss to design a long-range, four-engined flying boat large enough to hold a crew of five, which became known as the NC-4. Post World War I, peace brought a downturn in military contracts which saw the Curtiss company shrink significantly, and Glenn Curtiss returned to his love of racing to improve product development, only this time with racing aircraft instead of motorcycles. Worldwide demand for increasingly larger seaplanes continued to be a mainstay in the Curtiss company's survival during the pre-World War II era. Curtiss seaplanes won the Schneider Cup two consecutive races, 1923 and 1925. The 1925 race was won by U.S. Navy Lieutenant David Rittenhouse flying a Curtiss C.R.3 to 177.266 miles per hour. Piloted by US Army Lt. Cyrus Bettis, a Curtiss R3C won the Pulitzer Trophy Race on 12 October 1925, at a speed of 248.9 miles per hour. Thirteen days later, Jimmy Doolittle won the Schnieder in the same aircraft fitted with floats. Doolittle finished first with a top speed of 232.573 miles per hour. 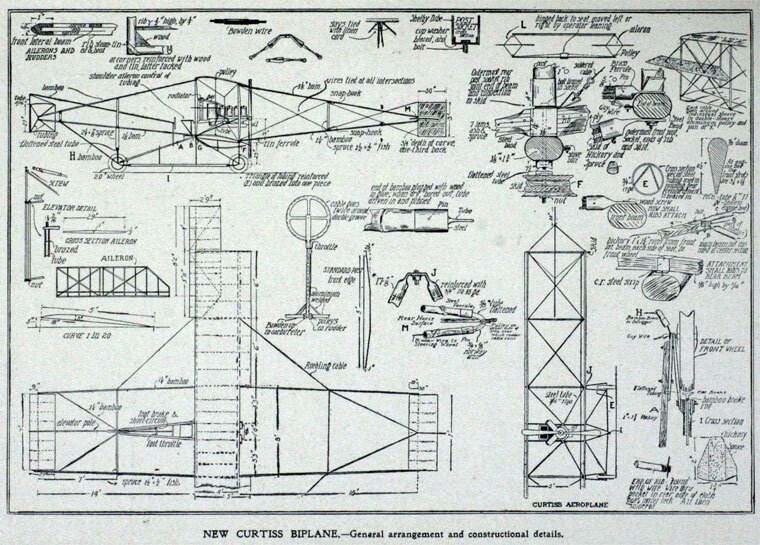 The patent dispute with the Wright brothers continued for several years until it was resolved during World War I. Since the last Wright aircraft, the Wright Model L was a single prototype of a "scouting" aircraft, made in 1916, the U.S. government, desperately short of combat aircraft, pressured both firms to resolve the patent dispute. In 1917, the U.S. government subsequently proferred a large and profitable contract to Curtiss to build aircraft for the U.S. Army. The Wright Aeronautical Corporation, a successor to the original Wright Company, ultimately merged with the Curtiss Aeroplane and Motor Company on 5 July 1929, forming the Curtiss-Wright company, just before Glenn Curtiss' death. Curtiss died in 1930 in Buffalo, New York, from complications after appendix surgery, and was buried in Pleasant Valley Cemetery in Hammondsport, New York. He was inducted into the National Aviation Hall of Fame in 1964, the Motorsports Hall of Fame of America in 1990, and the Motorcycle Hall of Fame in 1998. 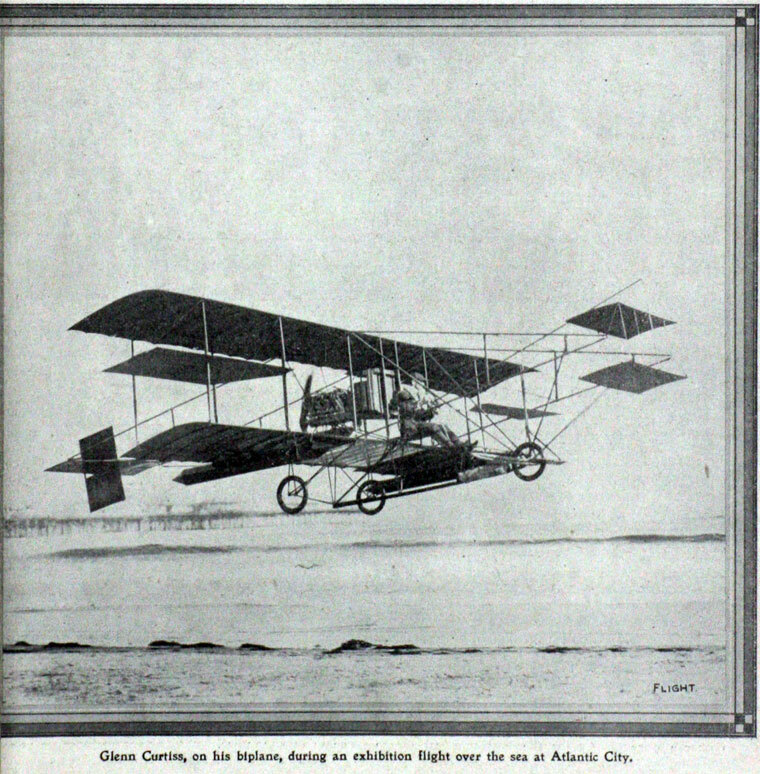 "THE LATE MR. GLENN CURTISS. Those who have followed the development of aviation on international lines since the very earliest days will learn with regret of the death, on Wednesday, July 23, of Mr. Glenn Hammond Curtiss. As one of the pioneers of American flying, Mr. Curtiss shared the perils, anxieties and disappointments of that period with the Wright Brothers, and coming through these risks successfully built up one of the two largest firms of aircraft constructors in the United States. Mr. Curtiss, who also, like the Wright Brothers, was the son of a clergyman, was born in 1878, and began his career in a cycle-repairing shop. He then in turn took up motor-cycle racing and motor-cycle building, his success in the latter field bringing him an order to build the engines for a dirigible. This task so interested him that thereafter he devoted himself entirely to the furtherance of aviation. In 1908 he designed his first aeroplane, which was known as the June Bug, and succeeded in flying it for a distance of about a mile. A year later he competed successfully at the International Aviation Meeting at Bheims, and in 1910 won a prize of 10,000 dols. for a three-hour flight from Albany to New York. Both the machines and the engines used on these three occasions were designed and built by him. 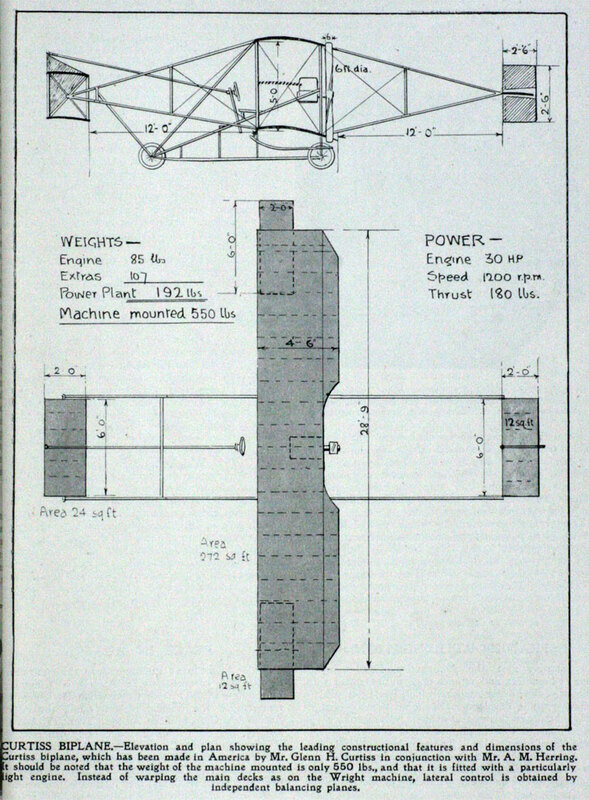 The former were comparable to a series of box kites with the engines placed between the wings, but they possessed the important features that the biplane tail had its counterpart in two small planes thrown out in front of the machine, and that for the first time the aileron principle was successfully used to secure balance. In a flight, which he made at the Langley aerodrome, he used-a twin monoplane, whose engine was placed between two pairs of wings fore and aft. Later on, he spent a considerable time in developing hydroplanes and flying boats, as well as in organising flying schools. By 1914, both boats and aeroplanes were, being manufactured, and his factories were working on commercial lines. They were therefore in a good position to meet war demands, with the result that a rapid expansion took place, and many new designs were evolved, the United States War Department naturally being their chief customer, followed by Great' Britain and, during the early part of the war, Russia. It is of interest to note that a Curtiss engine was employed in the-large German flying boat, Do. X." This page was last edited on 20 August 2018, at 05:57.